Ross Management Services (RMS), a subsidiary of Ross Companies, provides high-level property management services to the Mid-Atlantic region. They offer expertise in operations, marketing, mechanical services, asset management, environmental health, affordable and low-income housing tax credit, and technology trends for properties. RMS approached Graphcom to create a collection of freshly rebranded interior and exterior signage for a residential property in Annandale, Va. Previously, they worked with another sign company but were frustrated by their slow response time and uninspired design work. Looking for a change, they partnered with us to handle their needs, both creatively and under a tight deadline. 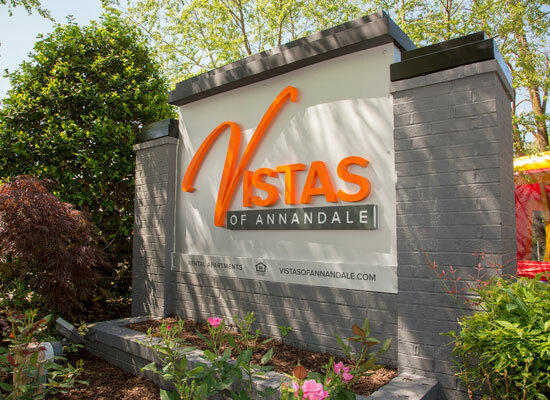 RMS wanted to create and install new signage before the grand reopening community event for their residential property, Vistas of Annandale, but the short deadline coupled with the number of signs needed meant this was a high-stakes project. Among the 201 signs requested were monument signs, banners, wayfinding signs, apartment unit signs, environmental graphics, and more, all of which Graphcom needed to create as efficiently and creatively as possible. RMS had just two months before the grand reopening, and needed 201 signage pieces designed, produced, and installed. First, we went straight to the property, meeting RMS’s vice president of marketing and touring the space. RMS wanted something that would set them apart from surrounding properties and make an impact on the community visitors attending the event. To do so, we discussed creating a monument sign that would be vibrant and eye-catching from a distance—something that was inviting rather than expected. This design would set the tone for the remaining signage. After taking time to understand what they were looking for, our designers put together a beautiful elevation drawing based on the site photos, dimensions, and design ideas. The pop of the bright orange against neutral backgrounds made the statement RMS was looking for. The entire RMS team was delighted with the designs and even requested additional interior and exterior signage. With a concrete, tight deadline and additional signage to create, we worked double time on production, running a second shift for both printing and installation to meet the client’s needs. Since the grand reopening, we’ve started to work on additional signage for RMS, including the design, fabrication, and installation of new interior signage for the leasing center renovation. Additionally, RMS has already ordered signage projects for other properties including Park Vue of Alexandria, Colvin Woods Apartments, and Horizon Square Apartments—and we expect the relationship to continue to grow from there. signage pieces were designed, produced, and installed. Time to Update Your Look? Get expert help with your new or existing signage design from Graphcom.